I currently work on a few different series, which I’d like to introduce to you one at a time. Today’s series is called, “Child’s Play”…Because for children their play is actually their work…the way they learn, develop, and understand the world around them! 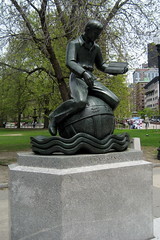 In “Playtime Games” (2012), the games of children are depicted~~Pin-the-Tail-on-the-Donkey, sparkling marbles, decorated flip-flops, the swirls of a turning top! For from the lessons learned in playing these games, they learn the lessons of life. In “Meow, Mr. Whiskers”, saying hello in cat language is a specialty of children who know their pets well. Not only is he a cat, he is a friend who just happens to love to play with a ball of fabric yarn. And, from this they learn to better communicate and interact with other living beings…including people! Meow, Mr. Whiskers, rayon on cotton, 7 1/4″ x 10″, © 2013 Joni Beach. In this series, I have fun exploring ways children learn, grow, and develop through fun and games, colors and crayons, animals and bugs, friends and family, and other wild, wonderful, awe-inspiring things, using brightly colored, quirky prints, vivid colored threads, and fun found objects! What do you think of when you think about children playing? Running?… jumping?… games?…having fun? and bright colors? This week I began a new series, Child’s Play. For a long time I have been collecting brightly colored fabrics with whimsical prints. 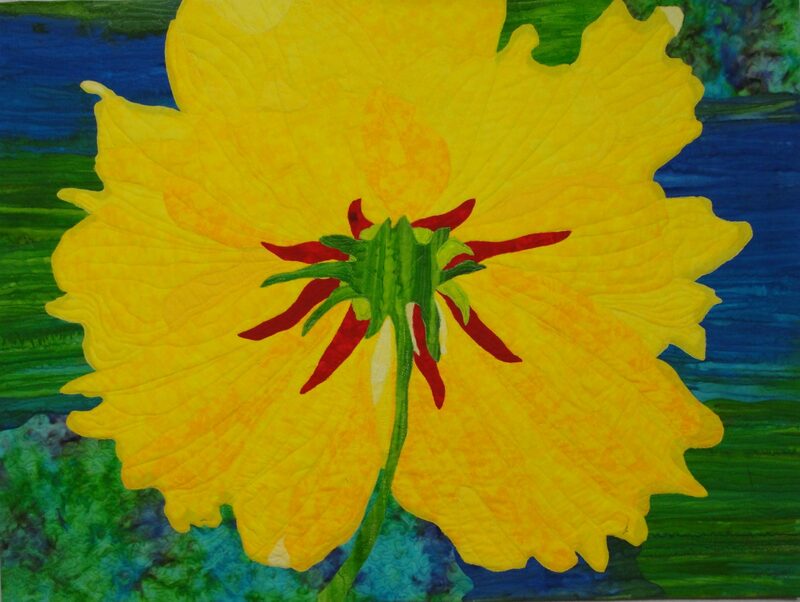 While I did not have a design idea for them yet, when my husband asked me about a small art quilt that might relate to children, my mind began focusing on a few different ideas. 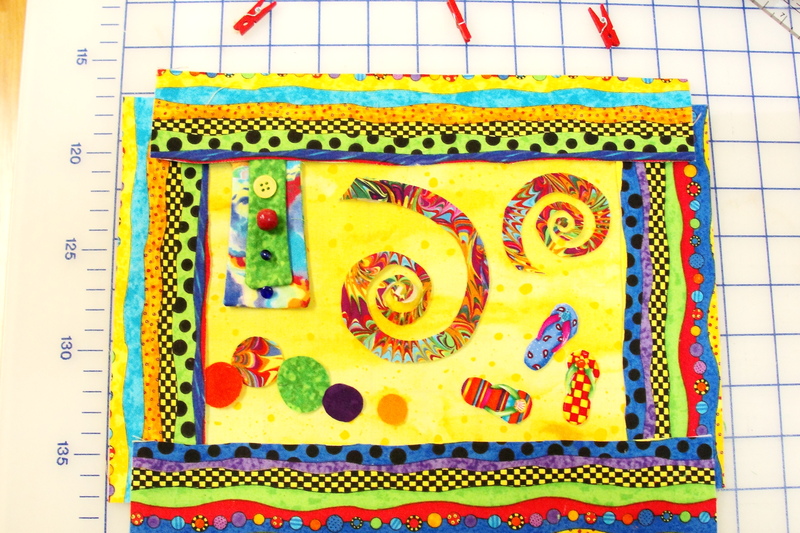 I thought of a favorite book on my shelf, Quilter’s Playtime: Games With Fabric by Dianne S. Hire. I was inspired to use the games of–spinners, pin-the-tail-on the-donkey, and marbles–in a composition entitled, Playtime Games. 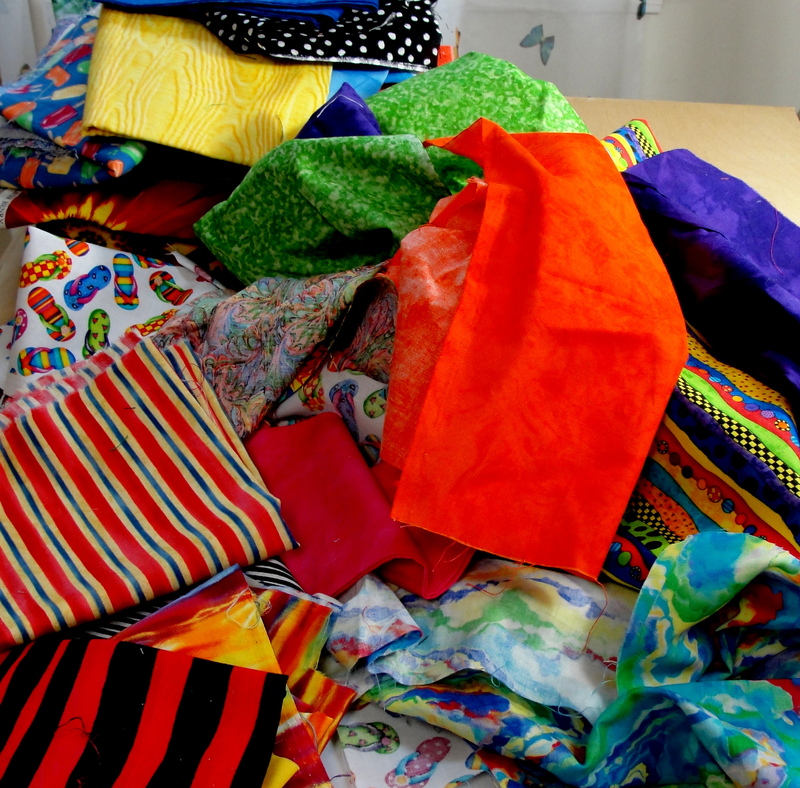 Pile of Fun, Colorful Fabrics. Then, I drew objects of the design on the paper backing of fusible web. (I like Lite Steam-a-Seam2 brand) These were then cut-out and arranged on the background fabric. To construct the tails, two pieces of fabric were sewn together wrong sides together, turned, and basted into place. I took digital photos to view the composition and placement of the pieces. When the desired effect was achieved, the top was fused into place. Lay-Out of Playtime Games, (c) 2012, Joni Beach. 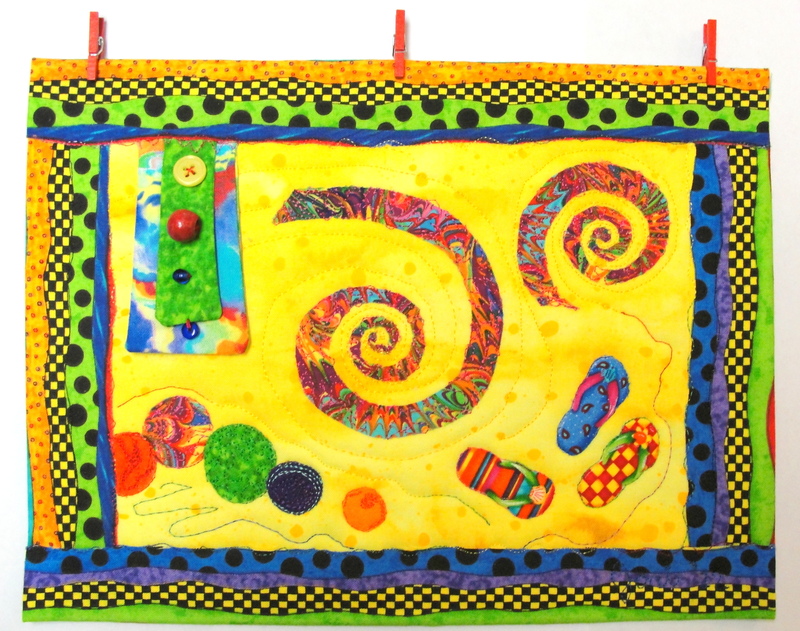 Playtime Games,10 1/2 X 7 3/4", Rayon on cotton, beads. (c) 2012 Joni Beach. Life, learning, and growing is…Child’s Play! This reminded me of a teaching concept--nurture a desire for lifelong learning. With an openness to continued learning, we take in new information and knowledge, which then impacts how we problem-solve, create, and behave. As an artist, we take in sensory experiences that impact our design process…whether through the music we compose, a wall-hanging we create, or a story that we write. With a world that is changing quickly everyday, the changes and the speed at which they occur challenges each of us and our families continually. While it can create stress, it can also be a catalyst for growth. It is exciting to consider the new possibilities for the future. It can be a stimulus for creativity, whether in our work or in our personal lives. Change, while not always welcome, can force us to consider alternate ways of doing things, encourage us to try new experiences, and to consider the world around us with new eyes. In our families, we can use the latest technology as an aid to communicate with each other, provide up-dated information, and as tools for learning, while not allowing it to become a negative focus that erodes our time together and relationships. and add quality and well-being to our work, families, and lives.